This is a collection of writings of one of Britains most prominent theologian and thinker. Donald M. MacKinnon has been one of the most important and influential of post-war British theologians and religious philosophers. Generally eclectic, frequently allusive, usually intellectually generous, persistently richly challenging and always astonishingly erudite, he had a significant impact on the development and subsequent theological work of the likes of Rowan Williams, Nicholas Lash, David Ford and John Milbank. A younger generation largely emerging from Cambridge, but with influence elsewhere, has more recently brought MacKinnon's normally occasionalist writing to a larger audience worldwide where it is beginning to receive noteworthy attention. In this collection several of MacKinnon's most outstanding papers not yet published in book format is collected together with an Editorial Introduction by a former student of one of MacKinnon's own students. They range from his reflections on theology as educational, the nature of moral reasoning, considerations of ecclesial practice, dogmatics and hope. Here is another reminder of MacKinnon's intellectual brilliance. Preface: Rowan Williams (alternatively Nichalas Lash); 1. 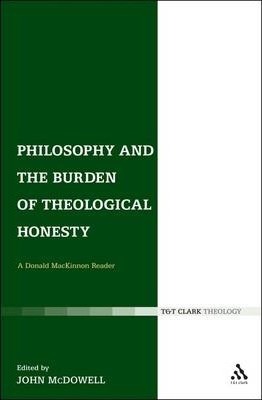 Editor's Introduction: 'Donald MacKinnon on Why an Honest Theology Cannot Stand Still'; 2. 'Theology as a Discipline of a Modern University' (1972). John McDowell is Morpeth Professor of Theology, University of Newcastle, NSW, Australia The Rt. Hon. and Most Reverend Rowan Williams is Archbishop of Canterbury. He was formerly Lady Margaret Professor of Divinity at Oxford and Archbishop of Wales.